Patagonia Xpress provide a safe, comfortable and luxurious way to sail between the popular tourist destinations in Indonesia. Backpackers and travellers, along with the locals, have grown to rely on the cheap and reliable service supplied by the company, covering Padang Bai, Bali and the Gili Islands on its ferry routes. 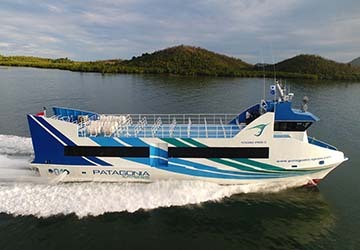 Stretching to 33 metres in length and 6 metres in breadth, Patagonia Xpress can carry up to 174 passengers on the fairly short crossings; two decks are available for passengers – the lower deck is a cosy space with fully functioning air conditioning, toilets, four 32” flat screen televisions and free Wi-Fi to keep you entertained. The Wi-Fi is a bonus but is often unnecessary considering the stunning views of the surrounding water and landscape, especially on the spacious sun deck which hosts a refreshing breeze to accompany the panoramic vistas. The horizon can be enjoyed in the knowledge that the sailing is provided on a sturdily built aluminium vessel. Not only does the ship lay home to modern facilities, there is a wide range of safety equipment on board, which alongside the diligent and organised staff, makes for a quick and secure crossing. Life jackets, fire extinguishers, GPS and AIS technology as well as a high tech CCTV system cater for every scenario, and ensures passenger safety is of paramount importance. Direct Ferries provides a ferry timetable and price comparison, based on your search criteria, allowing you to compare Patagonia Xpress products with multiple ferry company timetables and fares in one search. Compare Patagonia Xpress timetables and prices now with all alternative ferry operators before booking your ferry ticket to ensure you get the best option for your ferry trip.